Little Bai arrived in Gaoxing and went to the Red Eagle Wine Shop with two of his disciples, Red Eagle and Biggest Sister. The establishment belonged to Red Eagle and they had come so Little Bai could see it for himself at Red Eagle's suggestion. On their approached Red Eagle said "Something doesn't look right sir." Coming closer they saw a group of local thugs lazing about the place and bossing customers around. They acted as if they own the place and Red Eagle appeared to be surprised. Little Bai went inside and spoke to the man who seemed their leader. "What are you doing here in Red Eagle's Wine Shop?" He asked. "I already told him, this belongs to Fire Stick Gang now," said the man. Without a word Little Bai unleashed Sword Whipping Strike, causing all 11 of the men to drop, and leaving the leader staring at him in disbelief with a graze wound across his chest. "You!" He shouted. "Fire Crow King will beat you for this for sure." Little Bai told him to have his master come and fight him then sat down to eat. Red Eagle and Biggest Sister went inside and sat beside him. Red Eagle then began tending to customers after thanking his master. As they ate, Little Bai saw a distant crow flying toward the wine shop. As it came closer he soon realized it was no crow at all, but a wooden crow with strange devices attached to its belly. It struck his table and exploded with great force, wounding him and several others. Soon a large man, with fierce eyebrows and a heavy mustache came with 25 men. This was clearly Fire Crow King. Little Bai flew out into the street and unleashed another Sword Whipping Strike, dropping all of his men but doing little to the man himself. Fire Crow King then opened his mouth and unleashed a blast of flaming debris upon Little Bai. Little Bai replied with Blade of the Dancing Fox, cutting into Fire Crow King's chest as best he could. Fire Crow King then pointed his firelance at Little Bai, blasting him with divine fire and swinging the shaft around to strike him in this chest. Little Bai was growing concerned and decided to end the fight quickly, unleashing a relentless series of stabs, he brought Fire Crow King to the ground. When the battle was over, Little Bai noticed a crowd around him and an official surrounded by a retinue of men approached. The official said "I am Magistrate Wuzhan, I am pleased to meet such a hero." "Well I am Hero Bai,I am going to go drink at the Red Eagle Wine Shop Now." And Little Bai went to the Wine Shop to enjoy more wine and food. The magistrate followed and humbly presented himself again. "Hero Bai" said the Magistrate "You are indeed an impressive hero. You handled those men with great skill. I think we could use a man like yourself in Gaoxing." "I'd like to make you the constable....it won't be easy, I will have to pull some strings since it is doubtful you've passed the exams, but I think I can get you appointed to the position anyways." "Well, I hear constables solve mysteries," said Little Bai. "If that is what the job is, I'll do it. I want to solve some mysteries." "Well, yes, mysteries, of course, but your chief responsibility would be to protect me from men like Fire Crow King." "Excellent," said the magistrate. "Come to the government quarter soon and you will be given a title and office." Afterwards Little Bai went back to Stone Palace to prepare for his master's upcoming Wedding. Shen Chun went with Silent Dagger to speak with Master Zhao. They talked about the impending wedding but came primarily to complain about the jade and Five Dagger Cheng. Five Dagger Cheng had originally offered them 100 Million spades for the jade, and only gave them four. Zhao was deeply concerned and asked if there was another way he could keep them satisfied, as he knew Cheng's personality and didn't want a rivalry between them. He offered to pay them four million more spades which they accepted. Then they asked about his ninjas. "Well, they are not my ninjas," said Master Zhao. "If you want, I could arrange a meeting between you and one of my contacts. It is possible they might work with you." "I will send someone tonight. Just be careful and be polite. They are very useful allies, but you don't want them attacking you if you can avoid it." Later that night, while Shen Chun was discussing wedding arrangements with Da Mei Mei, a man arrived. He was dressed in armor they had never seen and said his name was Yen Paramizu. They talked and Paramizu said he could give him ten ninjas, if he brought him the hands of a slave named Zhendao. The slave was last said to be under the protection of Kang of Bone Kingdom. Shen Chun agreed and the man left. Baku: a Kushen warrior and representative of Bone Kingdom. 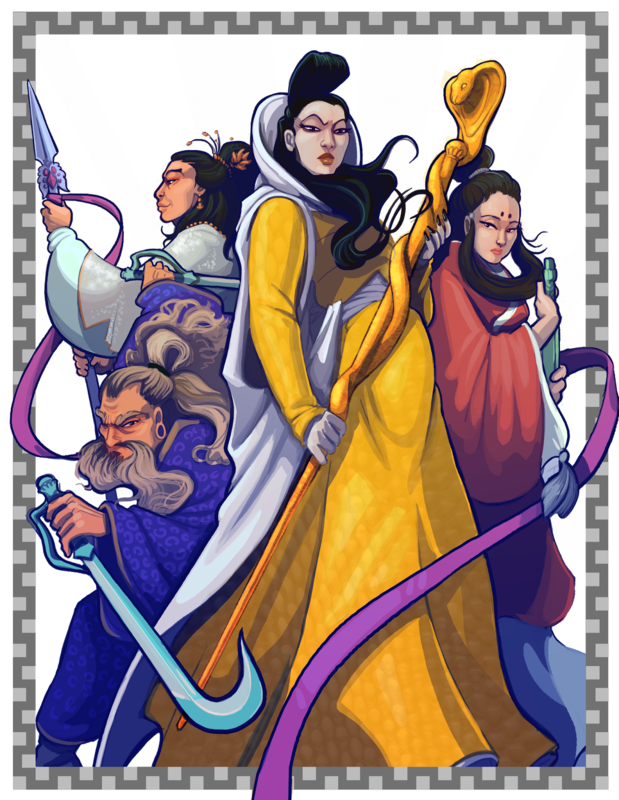 Abbess Ren: Representative of Perfect Heaven Lineage.Queen Lu Zhi: Leader of Heiping Sect. Chief Ping Wu: Northern Chief of the Nature Loving Monk SectAbbess Qingyun: A member of tree dwelling nun sect. Little Bai arrived and everyone prepared to leave for the wedding procession from Stone Palace Sect to their new headquarters on Stone Forest Hill (they had been building a villa and complex there for several months). When they reached the new headquarters they conducted the rites and then had a feast. At the feast the guests each came in turn to express their good wishes, and to mention any concerns their sect had. Most were polite and optimistic about Stone Palace sect. But Abbess Ren pointed an accusing finger at Shen Chun and said "Who orchestrates a wedding on the first day of the Demon Moon? *"
Shen Chun laughed and smiled. "Your sect failed to attend its own trial out Perfect Heaven Temple," She said. "You were supposed to send Seven-Faced Owl, and he never arrived. This is not through. And I think all present should question Stone Palace's intentions." Shen Chun dismissed her politely and she left in a huff. 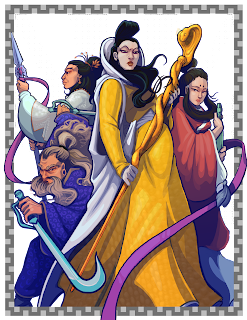 When they wedding was done, all retired and the next day, Shen Chun, Silent Dagger and Little Bai, along with a retinue of fifty men and people like Jade Priestess, set out for Gaoxing to learn more about Little Bai's new appointment. In Gaoxing Little Bai was brought before the magistrate who conferred his title upon him and gave him a medallion. He then was shown his office, which was staffed with ten soldiers and an assistant. The assistant told him there were no cases at the moment. "Okay" said Little Bai. "I have to go off and help my sect, if there are any mysteries, send a message to Stone Palace." The man agreed but appeared somewhat confused. The group then decided to head south the Banyan to find key allies and recruit people for a martial arts tournament set for a year's time. They first went to Golden Dragon Headquarters and asked to speak with Bronze Master. When they found him, he had a branding on his head with the characters for "Murderer", "Thief" and "Traitor". He was pleasant and polite. They told him of an upcoming tournament and asked if he'd send his best men. He agreed, though he admitted his best men were not great competitors. However in the course of the discussion they tried to work out an arrangement where he would help them spread the word about the tournament if they helped him settle his grudge with Kang of Bone Breaking Kingdom. At first he tried to use his old tricks, appearing righteous and above such concerns, but the branding on his head was obvious to all. "Look," said Silent Dagger "Shouldn't you dispense with this facade at this point?" Laughing, Bronze Master said "I can see you have and I share a villainous core. Okay, I would like to see Kang pay for branding my forehead. And if he happens to get branded by a just court, himself, to me that would be most suitable." Silent Dagger promised to work out the details and they left on good terms. Then they headed to Purple Cavern Sect. On the way they were attacked by Yakshas. It was still the demon moon and such creatures are plentiful at this time. The Yakshas swarmed their men and drew out their life blood with long sharp claws. In all they lost twenty five men but the party was able to kill the Yakshas. Da Mei Mei instructed the men to recover the Yaksha bones for further use. When they reached Purple Cavern, they appeared in a hall before Lady Plum Blossom. They flattered her and convinced her to send her best person to their tournament. When she agreed, they politely bid her farewell and headed deeper into the Banyan jungle. From there they went in search of the Hua Pi tribe. They soon found men wearing human skins and determined they were Hua Pi. They were told that an offering of human skin was the usually way to speech with their chief. They promised something better and were allowed an audience in their encampment. They spoke with Chief Ong. 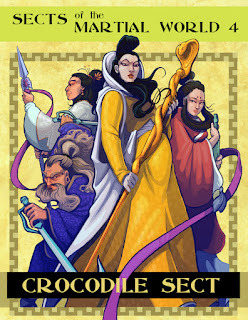 They promised him land in Hai'an (the former holdings of the Crocodile Sect) if he pledged men. He said he had 75 warriors. He seemed to think they were helping him invade a portion of Hai'an. He asked about the Queen and they promised to assist him if she gave any trouble. Very pleased, Ong agreed. They asked for a demonstration. He brought forth his champion, Bungert. Bungert fought against Little Bai and demonstrated some skill but was swiftly defeated. When they formally agreed, Chief Ong said "Let us feast, Bungert's weakness will make us all strong." Bungert's body was dragged from the tent and roasted upon a fire. When he was served, only Shen Chun dined and Little Bai dined upon the meat, finding it invigorated their bodies. *The demon moon is an unlucky time for humanity and a period when wicked supernatural forces are at their peak. This is not usually regarded as an auspicious time for weddings. This was the Ninth session of a new Wandering Heroes of Ogre Gate campaign. See the EIGHT SESSION LOG to read about the previous session. The party continued into the Tomb of the Red General, where they came to a T-section. Before them was a set of stairs, and to their left and right passageways. They took the left passage first. It ended in a mass of stone rubble, written in dried blood were the words "She Lies". Zhendao began sifting through the rubble and found the skeletal limb of a woman. He moved several of the stones, uncovering the rest of her body. She had been there for some time and was wearing yellow and blue robes. They cleared out some of the stone at the top of the rubble and it opened a small pass into another chamber. Zhendao moved the body back and they began to perform the Spirit Keeping rites upon it. As they did so a voice came from beyond the rubble saying "Bring me a replacement". "Who are you?" They asked her. "I am Hen-Shi," she said. "Bring me another body." The party led her to believe they would return with another body and ventured down the stairway at the T-Section. This brought them to a long pit, with a 20-foot fall into narrow spikes. There were six platforms throughout the room and at the other end a landing and some stairs. Upon one of the platforms they saw the upper torso of a mummified man. His hair was still black and long, and he rose up freely into the air. "You are agents of Brother Wolf!" he screamed. Looking back, the party saw the their stair passage was suddenly sealed by a flurry of iron threads. They tried to convince the man that they were not agents of bother wolf. And asked for him to explain what had happened. He told his name was Chief Chun or Stone Palace and that he had come here for the life-keeping stone with Brother Wolf and Sister Fox. He explained that Sister Fox took the stone, and that Brother Wolf had betrayed him on the way out, reducing him to his present state. He told them he wanted revenge and asked if they would help him. They discussed the possibility of helping orchestrate an ambush for Brother Wolf at the tomb. Chief Chun became more insistent, demanding the party betray Brother Wolf. They tried to extract information about the Life Ebbing venom, but he would not have that conversation. Shin Du attempted to bore him into telling them by reciting a long story. Chief Chun threw out a lash of iron threads, which wrapped around Shin Du's neck. Zhendao cut the thread with his butterfly swords. Song Pei accused Chief Chun of being rude, blasted the doorframe, to burst open the thread wall and they made their escape into the hall. They talked about going back to the woman at the rubble chamber, but decided they needed a body first. "I know where we can get a body," Said Zhendao. The party didn't asked any questions, they merely followed him to Crocodile Village where he went to a grove and puled out the body of a steamed bun vendor. They took the body back to the tomb and climbed with it through the opening into the chamber. There they saw a woman made of stone, emerge from the wall. Her eyes glowed blue, and she extended her arms. "If we give you this body will you help us?" Song Pei asked. She said yes and they presented the body before her. "What sort of help do you require?" "We need to find a solution to the Life Ebbeing Venom". "Life Ebbing Venom was made from the blood of the Dutiful Empress, therefore it is reasonable to assume that the blood of a powerful god or goddess would be required to make the antidote. You would also need a master physician, with exceptional skill at devising creative cures." They thanked her and left the chamber, careful to take samples of the Life Ebbing Venom on their way out. Before they did, the party returned to Chief Chun to arrange a deal. Song Pei tried to reach a deal so to get to the other side but it was fruitless. They asked why he wanted the Life-Keeping Stone in the first place, and Shen Chun said he retrieved it for his bride, Da Mei Mei of Relentless Corpse Sect. During this discussion, Zhendao stepped forward and offered to find Da Mei Mei for him. Cheif Chun misunderstood his words and said "You dare take my woman!" This led to considerable confusion, and ultimately the Chief believed he had come to trick him, so he unleashed an attack of Iron Threads from his spine and Zhendao narrowly evaded capture. However, Chief Chun clearly could not leave the chamber, so once he was out, Zhendao felt safe. As the party gathered outside, Shin Du snuck back and spoke privately with Chief Chun, convincing him to let them across if they relayed a message of challenge to Brother Wolf. The party left and decided to set out for Xuanlu, traveling through the hills. As they made their way, they saw a man in glittering golden robes, surrounded by maidens dressed in rose colored uniforms. "I am the great Shin Du" said Shin Du. "And who might you be?" "I am Flower-Handed Snake. And what is so great about you Shin Du?" Shin Du explained his skill in archery and when the man demanded an exhibition of his skills, he asked Flower-Handed Snake to hold his mace out to his side. Shin Du then fired an arrow so it bounded off a tree and grazed the skin of Flower-Handed Snakes hand. This infuriated Flower-Handed Snake and he leapt forward to attack. Zhendao played his flute, summoning Leather Shadow Puppets, which soon began to paralyze the man's limbs. Still he inhaled deeply and a storm of petals and debris washed over the party lacerating their flesh. The battle continued, but the man was soon fully paralyzed. His maidens leapt to his defense. The party managed to drop them. When the paralysis wore off, Flower-Handed snake tried to run away, so Shin Du shot him in the back with an arrow. Song Pei aided the fallen women, who wept for their master. As Ke-Yen took the body to a grove to offer it to the spirits, they pleaded to have the body so they could take it to his wife, Flower-Handed Widow. This was the eight session of a new Wandering Heroes of Ogre Gate campaign. See the SEVENTH SESSION LOG to read about the previous session. The party went to Jade Temple in Li Fan, where they had been told a massive piece of jade was being kept. They were hoping to use it to defeat the Plum Tree Monk and help save Sister Fox. However, they were sent by Chao, a chief of Glorious Death Cult, who only gave them the location if they swore to slaughter everyone present, except slaves. During the journey they debated what to do. Song Pei was opposed to slaughter and wanted to get around the oath by converting all the temple nuns to slaves. Zhendao did not understand this approach and wanted to do as they had promised. Ke-Yen's only concern was her loyalty to Brother Wold and Sister Fox. When they reached the mound where the temple was built, they crossed a field, and saw a tall old man, in jet black robes, eating from a box and laying out painting supplies. He looked to them as they approached. They asked who he was and he explained he was Supreme Master Tung, leader of the Glorious Death Cult, here to observe the slaughter. After a brief exchange of words they went to the front entrance of the temple. They knocked and spoke with a nun, then asked if they could speak with the head abbess. During the conversation, Song Pei explained that he wanted to avert an impending slaughter, and that Supreme Master Tung stood waiting in the fields. "Then I will stand here to defend against him if he is after the jade," She said. Song Pei tried to explain further but as he did, Zhendao leapt through the door and into the hall. The Abbess tried to stop him, and explained, with the help of Song Pei, that they could talk first. When they went inside, they heard a chanting that shook their bodies to the core and drained their health slowly. As this was going on, Ke-Yen finger flicked a stone at Supreme Master Tung and said "There will be no slaughter today!". He arose, said "Then you will all die," and walked away slowly. Inside the party gathered in a reception hall. The woman told them her name was Hao Min and she was the new abbess. They told her they were here for the jade. She explained that her predecessor had shown her a report, which she had a copy of and handed to then. Soon after the report was made her predecessor vanished. She told them that the nuns of the Jade Temple were under the authority of the Temple of Jade Mercies and that it was their duty to chant to crack a massive deposit of Jade kept in their main shrine. I also have a strange guess about the identity of this Plum Tree Monk. His obsession with the Life Keeping Stone, his weakness in the presence of the Jade, I suspect he may be the Red General, the Dutiful Empress’s protector and lover. But he’s gone mad and forgotten who he is….. They discussed the meaning. The woman explained that the jade was the corporeal shell, the phoenix spirit of the Dutiful Empress. She believed that if the Life-Keeping Stone was re-united with it, she could be restored. Ke-Yen explained they needed the Jade to fend off the Plum Tree Monk, and that the Life-Keeping Stone was keeping Sister Fox alive. "But you have been misinformed" she said. "The jade won't harm the Plum Tree Monk, it can only harm him if the Life-Keeping Stone is placed inside it. And even then it will most likely just restore his mind. He is the Red General. He merely forgot his past." Ke-Yen objected that this was all speculation on the part of her predecessor Abbess Xiruo. She acknowledge it was, but believed it was true. As the chanting continued to harm them, the abbess decided to help. Song-Pei had begun to meditate and she placed two fingers on his forehead, which began to glow. Ke-Yen interpreted this as an attack and leapt to her friend's defense. She and the Abbess exchanged blows, but the Abbess sent her to the ground with a devastating punch, knocking her out. She then resumed placing her fingers on Song-Pei's forehead, which transmitted a new Kung Fu technique directly to him. When she was done, he knew the Jade Wind Technique. This would enable him to resist the effect of the chanting. However, Zhendao had left in the confusion and went into the shrine. Against the wall was an enormous, egg-shaped piece of jade. It took up an entire wall. Before it he found 20 nuns lost in a meditative chant. He slit all their throats, finding it odd that none resisted. They bleed to death and he went over to touch the jade. As he did so, a powerful sense of sorrow and guilt overwhelmed him. He sat on the ground and began to meditate. The abbess heard the sudden silence and went into the shrine. There she quietly gathered the bodies of her nuns and prepared them for burial, saying nothing to Zhendao. In the aftermath, it was clear Zhendao had some remorse, and the abbess told him he would have to save ten lives for every life he took to undo the evil of the slaughter. Zhendao vowed to protect the jade at all costs. She explained that she also believed the jade needed to be protected, but that Smiling Abbot was due for another inspection soon. They discussed their options. 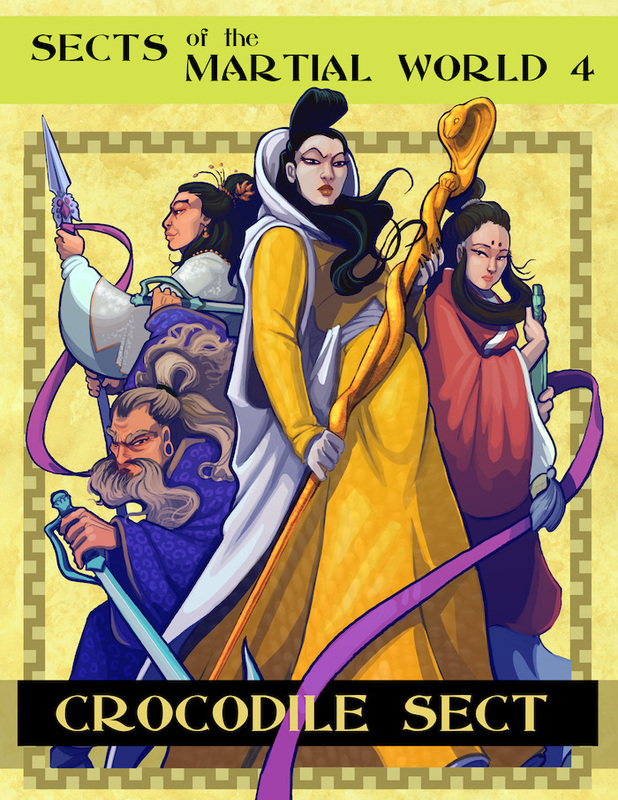 She convinced them of the importance of restoring the Life-Keeping Stone, but Ke-Yen would only do that if she could find a way to stop the life ebbing venom. The abbess scolded her saying that Sister Fox should die, that extending her life with the life-keeping stone required regular human sacrifices and went against her fate. However, she said if there was a cure to life ebbing venom (and she didn't think there was) the best place to look was the Tomb of the Red General, as that is where it was located in the first place. They talked and she agreed to lie to Smiling Abbot, telling him that the Glorious Death Cult had attacked them for the jade. That would buy her and the party some time. She told them that the tomb of the Red General was in Northern Hai'an near mount Hai'an. They should go there swiftly. They left and took a boat to Hai'an. They traveled to Crocodile Village, where a kind woman gave them shelter and food in exchange for Song Pei teaching the Classics to her sons. During the lessons, he cleverly learned the location of the Tomb of the Red General from them. He also learned that the tomb's initial trap was a spinning room. In the village, Zhendao spotted a steamed bun vendor and went over. The vendor handed him a bun and asked if he had anything to report. He said nothing, that he was not a Raksha anymore. The vendor withdrew his steamed bun and provided an alternative steamed bun "I suggest you eat this then". Zhendao said he would not do so, and insisted that he vendor eat the bun himself. He ate it and began to convulse. Zhendao dragged the man and the cart to the woods, then returned. They went to the tomb. They approached the main entrance, and examined the door. When they opened it, they threw something inside, and sure enough he room spun around with tremendous torque. They did it a few more times, then jammed it open and made their way inside.